Attention: This version of World War Z is for PS4 and many of the stores listed on Gocdkeys offer an account format version. The PS4 and Xbox One accounts give access to the game simply by accessing them through a username and password that you will receive by email after purchase. These versions may have a regional lock and are marked with the "Account Format" label in our price list. If the store does not have a tag, it means that the game is a physical version or a version in key form, which we simply enter into our account, PSN or Microsft, to activate it. World War Z is a thrilling third-person cooperative four-player shooter in which we'll face huge swarms of zombies with one thing on their heads, eating us. Inspired by the film, we'll travel vast expanses all over the world in search of a cure as we face legions of undead. To deal with this terrible threat that the world is consuming, we will have a huge arsenal of weapons of all kinds. Rocket launchers, machine guns, sentries, turrets, grenade launchers, barbed wire and much more. Don't forget that in order to survive, it will be essential to coordinate with the other members of the group. 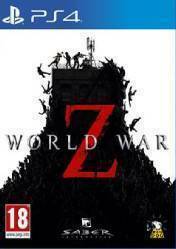 There are no comments yet about World War Z. You can be the first one!